A riveting history of the battle that permanently turned the tide of the Civil War. 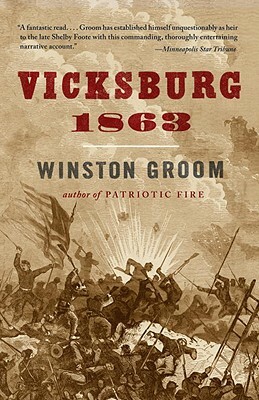 While Gettysburg is better known, Winston Groom makes clear in this engrossing narrative that Vicksburg was the more important battle from a strategic point of view. Re-creating the epic campaign that culminated at Vicksburg, Groom details the arduous struggle by the Union to gain control of the Mississippi River valley and to divide the Confederacy in two. He takes us back to 1861, when Lincoln chooses Ulysses S. Grant—seen at the time as a mediocre general with a drinking problem—to lead the Union army south from Illinois. We follow Grant and his troops as they fight one campaign after another, including the famous engagements at Forts Henry and Donelson and the bloodbath at Shiloh, until, after almost a year, they close in on Vicksburg. We witness Grant’s seven long months of battle against the determined Confederate army, and the many failed Union attempts to take Vicksburg, during which thousands of soldiers on both sides would be buried and, ultimately, the fate of the Confederacy would be sealed. As Groom recounts this landmark confrontation, he brings the participants to life. We see Grant in all his grim determination, the feistiness of William Tecumseh Sherman, and the pride and intransigence of Confederate leaders from Jefferson Davis and General Joseph E. Johnston to General John C. Pemberton, the Philadelphia-born Rebel who commanded at Vicksburg and took the blame for losing. A first-rate work of military history and an essential contribution to our understanding of the Civil War. Winston Groom is the author of fourteen previous books, including "Patriotic Fire, ""Shrouds of Glory, Forrest Gump, " and "Conversations with the Enemy "(with Duncan Spencer), which was a Pulitzer Prize finalist. He lives with his wife and daughter in Point Clear, Alabama. "An exciting, balanced account of what may have been the most decisive campaign of the Civil War. Vicksburg demanded the most sustained efforts of the conflict from both land and naval forces. Though the denouement is now well known, the story unfolds here with a sense of drama and unpredictability, and no inevitable outcome. It is all there--bravery and cowardice, competence and folly, fear and endurance, all with the constant, imponderable undertow of dumb luck, good and bad." "In Vicksburg, 1863 Winston Groom bids fair to assume the mantle of the late Shelby Foote as a most eloquent and moving storyteller of the Civil War. His prose is unbeatable, with a fine flair for drawing the drama out of isolated and seemingly minor episodes, while his pen portraits of individuals are crisp and incisive. The feel and smell and hardship of soldiers and civilians alike in a siege are all here in Vicksburg, 1863."